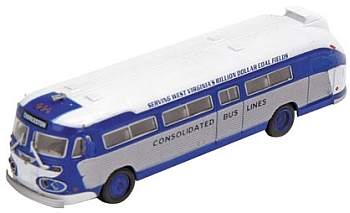 Ford C Delivery Van "ups"
Flxible Visicoach Bus "Northern Pacific - Missoula"
Flxible Visicoach Bus "Northern Pacific - Billings"
Flxible Visicoach Bus "Queen City - Charlotte"
Flxible Visicoach Bus "Queen City - Raleigh"
Flxible Visicoach Bus "Mass. Northeastern - Hampton Beach"
Flxible Visicoach Bus "Mass. 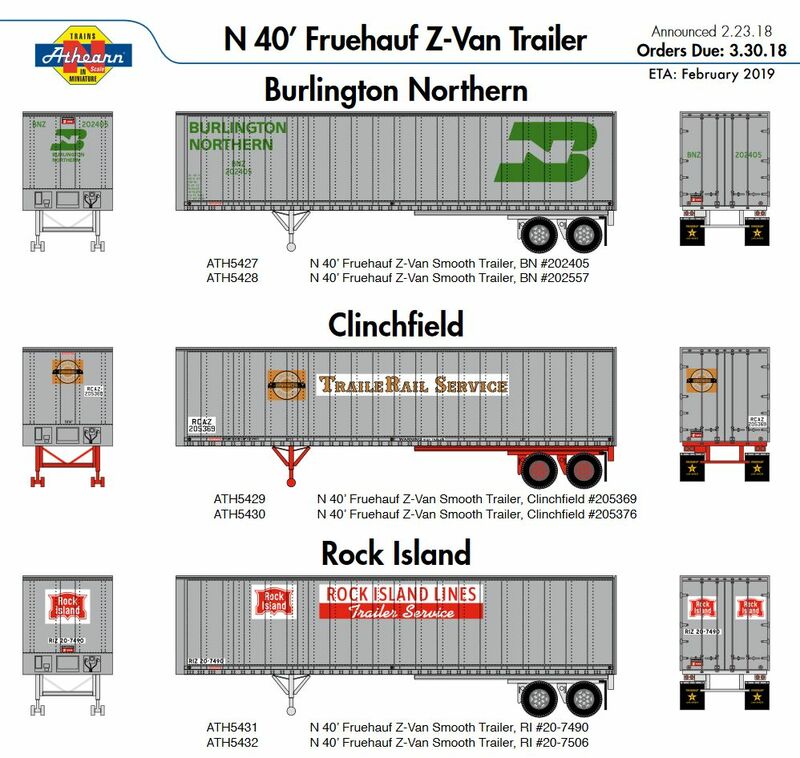 Northeastern - Lawrence"
Flxible Visicoach Bus "Acadian Lines - Amherst"
Flxible Visicoach Bus "Acadian Lines - Halifax"
Flxible Visicoach Bus "Rock Island - Topeka"
Flxible Visicoach Bus "Rock Island - Peoria"
Flxible Visicoach Bus "Maine Central - Bangor"
Flxible Visicoach Bus "Maine Central - Portland"
Flxible Visicoach Bus "Kansas City Southern - Kansas City"
Flxible Visicoach Bus "Kansas City Southern - Sallisaw"
Flxible Visicoach Bus "Intercity - Memphis"
Athearn Nr.17359, Flxible Visicoach Bus "Intercity - Charter"
Athearn Nr.17358, Flxible Visicoach Bus "Utah Parks Company- Zion"
Athearn Nr.17357, Flxible Visicoach Bus "Utah Parks Company- Zion"
Athearn Nr.17356, Flxible Visicoach Bus "Fred Harvey- Grand Canyon Village"
Athearn Nr.17355, Flxible Visicoach Bus "Fred Harvey- Hermit's Reet"
Athearn Nr.17354, Flxible Visicoach Bus "Consolidated Bus Lines- Roanoke"
Athearn Nr.17353, Flxible Visicoach Bus "Consolidated Bus Lines- Chareston"
Athearn Nr.17352, Flxible Visicoach Bus "Badger Bus Lines- Freeport"
Athearn Nr.17351, Flxible Visicoach Bus "Badger Bus Lines- Madison"
Athearn Nr.17090, N RTR 40' Exterior Post Trailer, "Unlettered"
Athearn Nr. 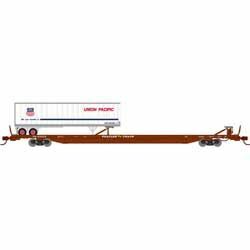 13896, Mack B & 40' Z-Van Trailer "Union Pacific"
Athearn Nr. 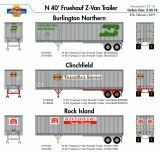 13895, Mack B & 40' Z-Van Trailer "Johnabury"
Athearn Nr. 13894, Mack B & 40' Z-Van Trailer "Red Owl"
Athearn Nr. 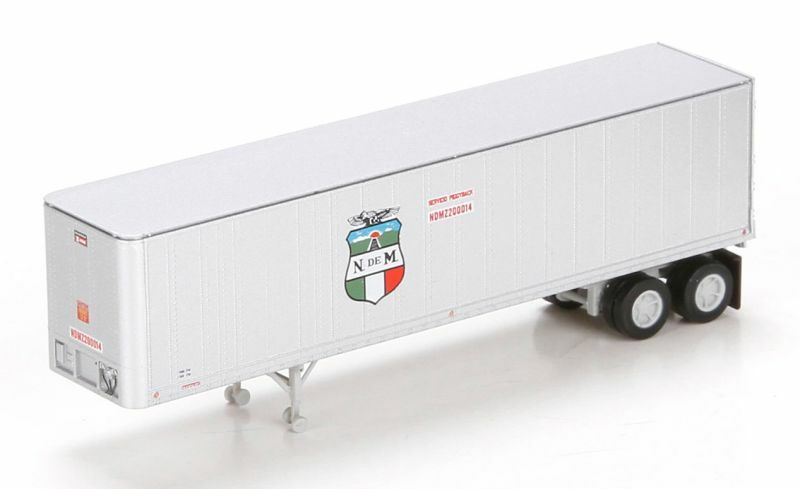 13893, Mack B & 40' Z-Van Trailer "Neuendorf"
Athearn Nr. 13892, Mack B & 40' Z-Van Trailer "CB&Q"
Athearn Nr. 13891, Mack B Tow truck "Slauson Towing"
Athearn Nr. 13890, Mack B Tow truck "B&B Towing"
Athearn Nr. 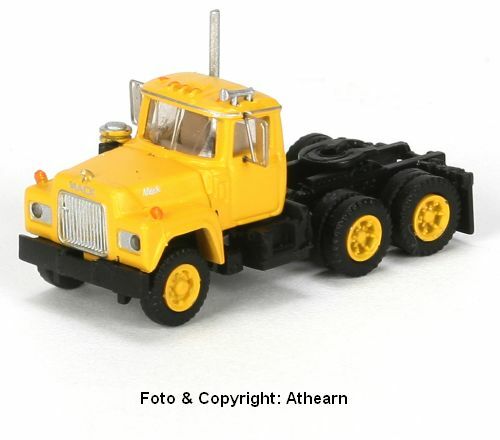 13889, Mack B Tow truck "One Star Towing"
Athearn Nr. 13888, Mack B Tow truck "Rocky Mtn Road Towing"
Athearn Nr. 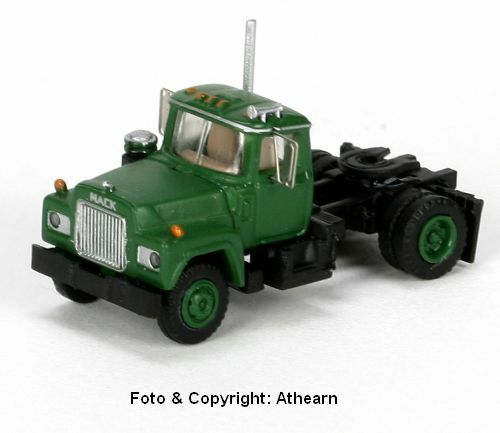 13887, Mack B Tow truck "Ace's High Salvage"
Athearn Nr. 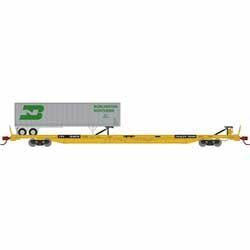 13886, Mack B Tow truck "Green Leaf Towing"
Athearn Nr. 13880, Mack R Single Rear Axle Tractor with 2 28-foot pup trailers "Smith"
Athearn Nr. 13879, Mack R Single Rear Axle Tractor with 2 28-foot pup trailers "Murphy"
Athearn Nr. 13878, Mack R Single Rear Axle Tractor with 2 28-foot pup trailers "Roadway/Ex"
Athearn Nr. 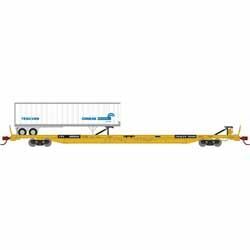 13877, Mack R Single Rear Axle Tractor with 2 28-foot pup trailers "Roadway"
Athearn Nr. 13876, Mack R Single Rear Axle Tractor with 2 28-foot pup trailers "Advance"
Athearn Nr. 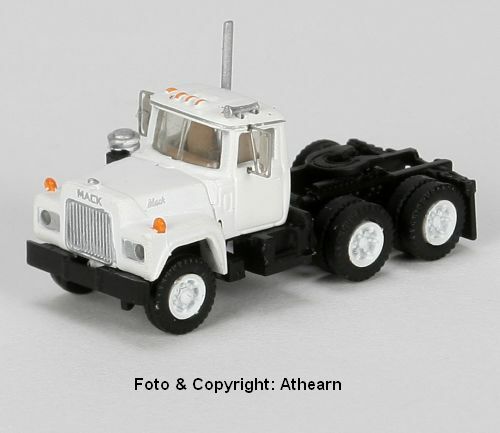 13870, Mack R Dump Truck, "Rich Johnson"
Athearn Nr. 13865, Mack R Dump Truck "D. Claybrooks"
Athearn Nr. 13864, Mack R Dump Truck "All American"
Athearn Nr. 13863, Mack R Dump Truck "King's Constructions"
Athearn Nr. 13862, Mack R Dump Truck "Public Works"
Athearn Nr. 13861, Mack R Dump Truck "Union Pacific"
Athearn Nr. 13860, Mack R Cement Mixer "Ross Island"
Athearn Nr. 13859, Mack R Cement Mixer "Rolla Ready Mix"
Athearn Nr. 13858, Mack R Cement Mixer "Platte County Ready Mix"
Athearn Nr. 13857, Mack R Cement Mixer "National Lime & Stone"
Athearn Nr. 13856, Mack R Cement Mixer "Concrete Ready Mix"
Athearn Nr. 13855, Mack R Cement Mixer "USA"
Athearn Nr. 13854, Mack R Cement Mixer "Conrock"
Athearn Nr. 13853, Mack R Cement Mixer "A & A"
Athearn Nr. 13852, Mack R Cement Mixer "Edmier Inc."
Athearn Nr. 13851, Mack R Cement Mixer "Berkeley Ready Mix"
Athearn Nr. 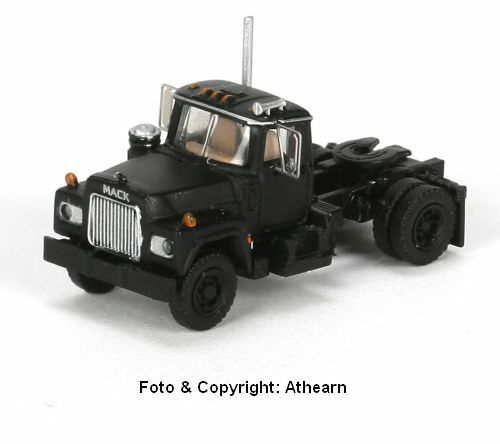 13845, Mack R Tow truck "Mountain Towing"
Athearn Nr. 13844, Mack R Tow truck "Mike's Auto Repair"
Athearn Nr. 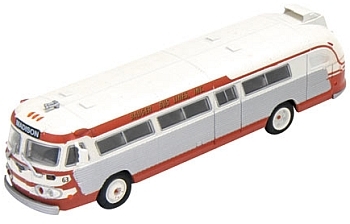 13843, Mack R Tow truck "Main Street Garage"
Athearn Nr. 13842, Mack R Tow truck "J & R Towing"
Athearn Nr. 13841, Mack R Tow truck "Acme Towing"
Athearn Nr.12195, Mack "B" with 40' Expost Trailer "Santa Fe"
Athearn Nr.12194, Mack "B" with 40' Expost Trailer "Roadway"
Athearn Nr.12193, Mack "B" with 40' Expost Trailer "Pennsylvania"
Athearn Nr.12192, Mack "B" with 40' Expost Trailer "Missouri Pacific"
Athearn Nr.12191, Mack "B" with 40' Expost Trailer "Canadian Pacific"
Athearn Nr.12190, Mack "R" with 40' Expost Trailer "Overnite"
Athearn Nr.12189, Mack "R" with 40' Expost Trailer "Mushroom"
Athearn Nr.12188, Mack "R" with 40' Expost Trailer "Holmes"
Athearn Nr.12187, Mack "R" with 40' Expost Trailer "Fredrickson"
Athearn Nr.12186, Mack "R" with 40' Expost Trailer "Eazor"
Athearn Nr. 12185, Mack B Tandem Rear Axle Tractor "Union Pacific"
Athearn Nr. 12184, Mack B Single Rear Axle Tractor "Southern Pacific"
Athearn Nr. 12183, Mack B Single Rear Axle Tractor "Santa Fe"
Athearn Nr. 12182, Mack B Tandem Rear Axle Tractor "Roadway"
Athearn Nr. 12181, Mack B Tandem Rear Axle Tractor "CB & Q"
Athearn Nr.12170, RTR Mack B Cement Truck, "American Aggregates "
Athearn Nr.12169, RTR Mack B Cement Truck, "Whitley's Ready Mixed "
Athearn Nr.12168, RTR Mack B Cement Truck, "Acme"
Athearn Nr.12167, RTR Mack B Cement Truck, "Jousma"
Athearn Nr.12166, RTR Mack B Cement Truck, "Western Concrete"
Athearn Nr. 12165, Mack B Dump Truck "Edmier"
Athearn Nr. 12164, Mack B Dump Truck "Sohio"
Athearn Nr. 12163, Mack B Dump Truck "Joseph Burge"
Athearn Nr. 12162, Mack B Dump Truck "Watson"
Athearn Nr. 12161, Mack B Dump Truck "CZ Landscape"
Athearn Nr. 12155, Mack B Cement Mixer "Tews Cement"
Athearn Nr. 12154, Mack B Cement Mixer "Ready Mix Concrete"
Athearn Nr. 12153, Mack B Cement Mixer "Pre Mix"
Athearn Nr. 12152, Mack B Cement Mixer "Erie Builders"
Athearn Nr. 12151, Mack B Cement Mixer "Cleveland Builders"
Athearn Nr. 12150, Mack B Tow truck "Tri State Towing"
Athearn Nr. 12149, Mack B Tow truck "Stubb's Towing"
Athearn Nr. 12148, Mack B Tow truck "Route 66"
Athearn Nr. 12147, Mack B Tow truck "Not For Hire"
Athearn Nr. 12146, Mack B Tow truck "Flying A Tow"
Athearn Nr. 12145, Mack B Tow truck "Malcom Service"
Athearn Nr. 12144, Mack B Tow truck "America's Roadside Asst"
Athearn Nr. 12143, Mack B Tow truck "Cooter's Tire & Service"
Athearn Nr. 12142, Mack B Tow truck "Iowa 80 Truck Stop"
Athearn Nr. 12141, Mack B Tow truck "Police Department"
Athearn Nr.10829, 2-28' Trailer with Dolly "Ringsby United"
Athearn Nr.10828, 2-28' Trailer with Dolly "P.I.E." Athearn Nr.10827, 2-28' Trailer with Dolly "Preston"
Athearn Nr.10826, 2-28' Trailer with Dolly "McLean"
Athearn Nr.10825, 2-28' Trailer with Dolly "Spartan"
Athearn Nr.10824, 2-28' Trailer with Dolly "USF"
Athearn Nr.10823, 2-28' Trailer with Dolly "Overmite"
Athearn Nr.10822, 2-28' Trailer with Dolly "Yellow/Kansas Special"
Athearn Nr.10821, 2-28' Trailer with Dolly "Roadway"
Athearn Nr.10820, 2-28' Trailer with Dolly "CF"
Athearn Nr.10817, Ford C with 28' Trailer "CF"
Athearn Nr.10816, Ford C with 28' Trailer "Roadway/Time Critical"
Athearn Nr.10815, Ford C with 28' Trailer "Roadway"
Athearn Nr.10814, Ford C with 28' Trailer "Roadway Express"
Athearn Nr.10813, Ford C with 28' Trailer "Roadway"
Athearn Nr.10812, Ford C with 28' Trailer "IML"
Athearn Nr.10811, Ford C with 28' Trailer "DHE"
Athearn Nr.10810, Ford C with 28' Trailer "Spartan"
Athearn Nr.10809, Ford C with 28' Trailer "Athearn"
Athearn Nr.10808, Ford C with 28' Trailer "Willig"
Athearn Nr.10807, Ford C with 28' Trailer "Superior Fast Freight"
Athearn Nr.10806, Ford C with 28' Trailer "Di Salvo"
Athearn Nr.10805, Ford C with 28' Trailer "Delta"
Athearn Nr.10804, Ford C with 28' Trailer "Advance"
Athearn Nr.10803, Ford C with 28' Trailer "Owner - Operator"
Athearn Nr.10802, Ford C with 28' Trailer "CF - No Zone"
Athearn Nr.10801, Ford C with 28' Trailer "Consolidated Freightways"
Athearn Nr.10754, Ford C Short Wheel Base Fire Truck, "Fire Rescue #2"
Athearn Nr.10753, Ford C Short Wheel Base Fire Truck, "Tri State Volunteer Fire #10"
Athearn Nr.10752, Ford C Short Wheel Base Fire Truck, "County Fire #8"
Athearn Nr.10751, Ford C Short Wheel Base Fire Truck, "Fire Protection District #197"
Athearn Nr.10750, Ford C Short Wheel Base Fire Truck, "Truck Company #29"
Athearn Nr.10749, Ford C Short Wheel Base Fire Truck, "County Fire #11"
Athearn Nr.10736, Ford C Short Fire Truck, "Fire Rescue #2"
Athearn Nr.10735, Ford C Short Fire Truck, "Tri State Volunteer Fire #10"
Athearn Nr.10734, Ford C Short Fire Truck, "County Fire #8"
Athearn Nr.10733, Ford C Short Fire Truck, "Fire Protection District #197"
Athearn Nr.10732, Ford C Short Fire Truck, "Truck Company #29"
Athearn Nr.10731, Ford C Short Fire Truck, "County Fire #11"
Athearn Nr.10410, Ford C Fire Truck, "John Deere"
Athearn Nr.10409, Ford C Fire Truck, "John Deere"
Athearn Nr.103 ?, Ford C mit Trailer, Limitierte Auflage "Delaware"
Athearn Nr.10296, Ford C Fire Rescue Truck "San Francisco"
Athearn Nr.10294, Ford C Fire Rescue Truck "Boston"
Athearn Nr.10295, Ford C Fire Rescue Truck "Detroit"
Athearn Nr.10293, Ford C Fire Rescue Truck "Washington, DC"
Athearn Nr.10292, Ford C Fire Rescue Truck "Chicago"
Athearn Nr.10291, Ford C Fire Rescue Truck "Bethpage, NY"
Athearn Nr.10284, Ford C Fire Truck Perryville "Bicentennial"
Athearn Nr.10283, Ford C Fire Truck Highspire "Bicentennial"
Athearn Nr.10282, Ford C Fire Truck Napa "Bicentennial"
Athearn Nr.10281, Ford C Fire Truck "ST. Louis"
Athearn Nr.10280, Ford C Fire Truck "Milwaukee"
Athearn Nr.10279, Ford C Fire Truck "Los Angeles"
Athearn Nr.10272, Ford C Fire Truck "San Francisco"
Athearn Nr.10271, Ford C Fire Truck "Detroit"
Athearn Nr.10270, Ford C Fire Truck "Boston"
Athearn Nr.10269, Ford C Fire Truck "Washington, DC"
Athearn Nr.10268, Ford C Fire Truck "Chicago"
Athearn Nr.10267, Ford C Fire Truck "Riverside County"
Athearn Nr.10266, Ford C Fire Truck "Fire Rescue"
Athearn Nr.10265, Ford C Fire Truck "Volunteer Fire"
Athearn Nr.10264, Ford C Fire Truck "County Fire"
Athearn Nr.10263, Ford C Fire Truck "Fire Protection Destrict"
Athearn Nr.10262, Ford C Fire Truck "Engine Company 52"
Athearn Nr.10261, Ford C Fire Truck "County Fire Dept." 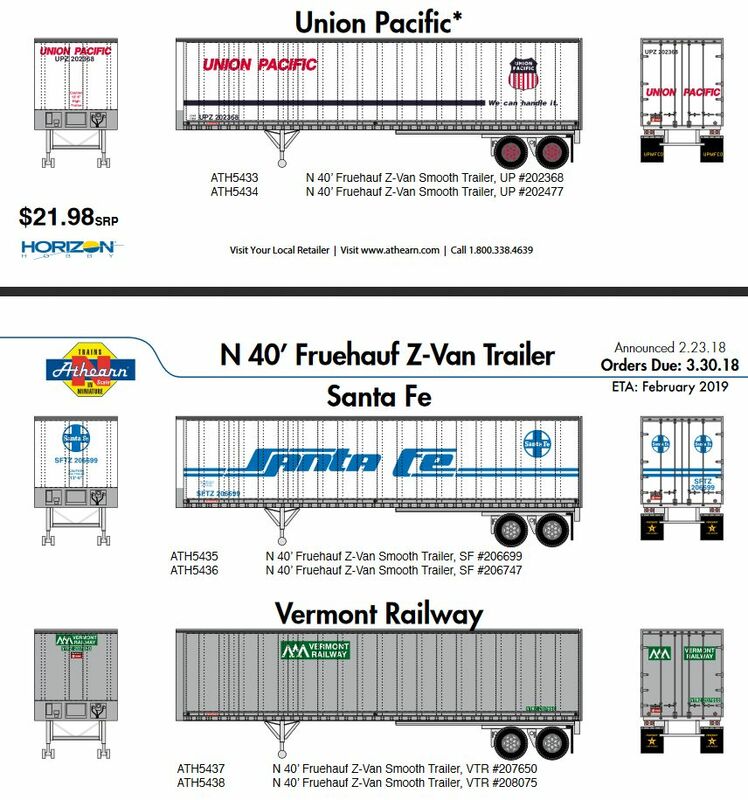 Athearn Nr.10250, Ford C, Cabover Box Van "US Mail"
Athearn Nr.10208, Ford C, Cabover Box Van "Coke"
Athearn Nr.10206, Ford C, Cabover Box Van "Coke Bottles"
Athearn Nr.10205, Ford C, Cabover Box Van "Coca Cola"
Athearn Nr.10204, Ford C, Cabover Box Van "Coca Cola"
Athearn Nr.10203, Ford C, Cabover Box Van "Coca Cola"
Athearn Nr.10202, Ford C, Cabover Stake Bed Truck "Coca Cola"
Athearn Nr.10201, Ford C, Cabover Box Van "Coca Cola"
Athearn Nr.10200, Ford C, Cabover Stake Bed Truck "Coca Cola"
Athearn Nr.10197, 2-28' Trailer with Dolly "Yellow"
Athearn Nr.10195, Ford C, Cabover Stake Bed Truck "John Deere Service"
Athearn Nr.10194, Ford C, Cabover Semi Tractor "John Deere"
Athearn Nr.10193, Ford C, Cabover Box Van "John Deere Model D"
Athearn Nr.10192, Ford C, Cabover Box Van "John Deere New Generation"
Athearn Nr.10191, Ford C, Cabover Box Van "John Deere 50 &60 Series"
Athearn Nr.10190, Ford C, Cabover Stake Bed Truck "John Deere"
Athearn Nr.10185, John Deere Model D Tractor, 3 Stk. Athearn Nr.10183, John Deere 6420 Tractor, 3 Stk. (Die Produktion wurde vorzeitig wieder eingestellt). 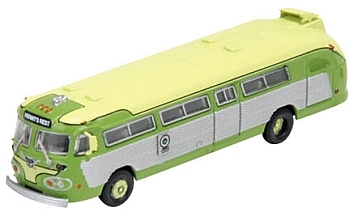 Athearn Nr.10182, John Deere "60" Tractor, 3 Stk. Athearn Nr.10181, John Deere "50" Tractor, 3 Stk. Athearn Nr.10180, John Deere Model B Tractor, 3 Stk. 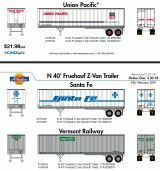 Athearn Nr.10098, Ford C, Cabover Box Van "REA"
Athearn Nr.10097, Ford C, Cabover Box Van "Speedway Express"
Athearn Nr.10096, Ford C, Cabover Box Van "Roadway"
Athearn Nr.10095, Ford C, Cabover Box Van "Red Ball"
Athearn Nr.10094, Ford C, Cabover Box Van "OK Trucking"
Athearn Nr.10093, Ford C, Cabover Box Van "Jones Transfer"
Athearn Nr.10092, Ford C, Cabover Box Van "Bekins"
Athearn Nr.10091, Ford C, Cabover Box Van "Kansas City Southern"
Athearn Nr.10090, Ford C, Cabover Box Van "D & RGW Late"
Athearn Nr.10089, Ford C, Cabover Box Van "D & RGW Early"
Athearn Nr.10088, Ford C, Cabover Box Van "Western Pacific"
Athearn Nr.10087, Ford C, Cabover Box Van "Fredrickson"
Athearn Nr.10086, Ford C, Cabover Box Van "REA"
Athearn Nr.10085, Ford C, Cabover Box Van "Great Northern"
Athearn Nr.10084, Ford C, Cabover Box Van "Roadway Express"
Athearn Nr.10083, Ford C, Cabover Box Van "Southern Pacific"
Athearn Nr.10082, Ford C, Cabover Box Van "Blue Cab"
Athearn Nr.10081, Ford C, Cabover Box Van "Red Cab"
Athearn Nr.10080, Ford C, Cabover Box Van "White Cab"
Athearn Nr.10076, Ford C, Cabover Stake Bed Truck "Southern Pacific"
Athearn Nr.10075, Ford C, Cabover Stake Bed Truck "Great Northern"
Athearn Nr.10074, Ford C, Cabover Stake Bed Truck "Chessie"
Athearn Nr.10073, Ford C, Cabover Stake Bed Truck "Canadian Pacific"
Athearn Nr.10072, Ford C, Cabover Stake Bed Truck "PRR"
Athearn Nr.10071, Ford C, Cabover Stake Bed Truck "NYC"
Athearn Nr.10070, Ford C, Cabover Stake Bed Truck "D & RGW"
Athearn Nr.10069, Ford C, Cabover Stake Bed Truck "CR"
Athearn Nr.10068, Ford C, Cabover Stake Bed Truck "Pacific Fruit Express"
Athearn Nr.10067, Ford C, Cabover Stake Bed Truck "BN"
Athearn Nr.10066, Ford C, Cabover Stake Bed Truck "Northern Pacific"
Athearn Nr.10065, Ford C, Cabover Stake Bed Truck "Preston"
Athearn Nr.10064, Ford C, Cabover Stake Bed Truck "Union Pacific"
Athearn Nr.10063, Ford C, Cabover Stake Bed Truck "Santa Fe"
Athearn Nr.10062, Ford C, Cabover Stake Bed Truck "Blue Cab"
Athearn Nr.10061, Ford C, Cabover Stake Bed Truck "Red Cab"
Athearn Nr.10060, Ford C, Cabover Stake Bed Truck "White Cab"
Athearn Nr.10052, Ford C Box Van, "Union Pacific"
Athearn Nr.10051, Ford C Box Van, "Santa Fe"
Athearn Nr.10050, Ford C Box Van, "Great Northern Sky Blue"
Athearn Nr.10049, Ford C Box Van, "Burlington Northern"
Athearn Nr.10048, Ford C, Cabover Single-Axle Semi Tractor "New York Central"
Athearn Nr.10047, Ford C, Cabover Single-Axle Semi Tractor "Spartan"
Athearn Nr.10046, Ford C, Cabover Single-Axle Semi Tractor "Delta"
Athearn Nr.10045, Ford C, Cabover Single-Axle Semi Tractor "Advance"
Athearn Nr.10044, Ford C, Cabover Single-Axle Semi Tractor "TNT-Roadway"
Athearn Nr.10043, Ford C, Cabover Single-Axle Semi Tractor "Roadway"
Athearn Nr.10042, Ford C, Cabover Single-Axle Semi Tractor "Blue Cab"
Athearn Nr.10041, Ford C, Cabover Single-Axle Semi Tractor "Red Cab"
Athearn Nr.10040, Ford C, Cabover Single-Axle Semi Tractor "White Cab"
Athearn Nr.99062, Ford C Box Van, "Kalmbach Publishing"